Whey Protein is an animal based protein originating from cow’s milk. It is a “complete” protein, meaning it contains all nine of the essential amino acids that the body does not naturally produce. Soy Protein is a plant-based protein originating from the soybean plant. Soy protein is a complete protein, like whey, and is one of the only non-animal based proteins that is “complete”. Soy is a great protein source for vegan or lactose intolerant individuals. Casein Protein, like whey, is a milk-based protein. It makes up 80% of the protein in cow’s milk, making it more abundant that whey. It is also a complete protein. What Protein Source is Best for Athletes? The effects of soy and whey protein consumption on building muscle mass were compared in a study done on male athletes. Results revealed that both whey and soy consumption increased muscle mass when combined with exercise training. It also concluded that there was no significant difference in muscle mass gains between the two protein sources. This disproves the pre-conceived notion that whey is a better protein source to increase one’s lean body mass than soy. In fact, this study also showed that, in addition to increasing muscle mass, soy protein provides important antioxidants not provided by whey. So, while both whey and soy protein increase muscle mass when paired with exercise, soy protein has the added benefit of containing antioxidants, but this is far from the end of the debate. When determining the best protein source for athletes, it is also essential to consider the protein’s absorption rate. Can the Timing of Protein Consumption Affect the Repairing and Building of Muscles? Sources say yes. In fact, whey protein is found to have the fastest absorption rate among all proteins. This knowledge can be used in strategically developing a post-workout fueling plan as the fast absorption of whey protein allows for the quick rebuilding of muscles after consumption. This characteristic makes whey protein great for both pre-workout fuel (the protein can be utilized quickly) and post-workout recovery (to rebuild the muscles that were broken down). On the other end, soy protein has an intermediate absorption rate, which makes it less effective in immediately rebuilding muscle; however, it is vital in the building of new muscles tissue. Lastly casein protein has the slowest absorption rate but in doing so it elevates plasma amino acid levels for the longest period of time. These free amino acids can be used to build muscle hours after exercise. Each of these protein sources provides different benefits, and incorporating all three into a nutrition plan will kickstart muscle synthesis immediately after exercise and maintain it for several hours post-workout. In What Foods and Supplements Can Athletes Find Each Type of Protein? Some common sources of soy protein include edamame and tofu. Soy protein can also be found in powder that can be added to smoothies or sprinkled in cereal. There are also many varieties of soy milk, cheese and yogurt. 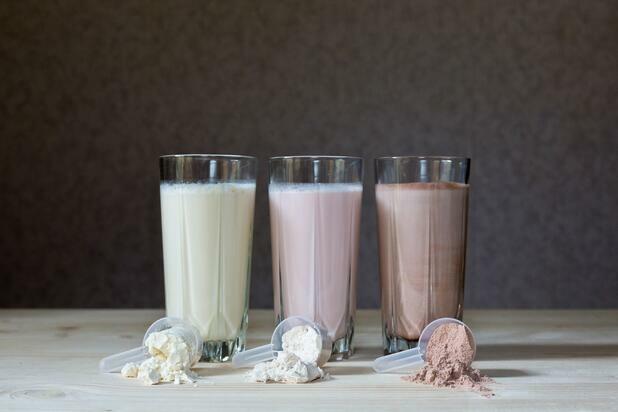 A small amount of whey protein is naturally found in milk, cheese and yogurt, but is most commonly marketed in protein powders, shakes and other dietary supplements. This allows for a greater amount of whey protein content to be consumed, which is more protein that is available in natural foods. A few commonly known brands that sell products with whey protein include Muscle Milk, Gatorade and EAS Sports Nutrition. Lastly casein protein is found in milk and makes up 80% of the protein in milk sources. Casein protein can also be found in powders aswith soy and whey. It is important for athletes to find to find a nutrition regimen that works for their personal lifestyle and workout schedules. While whey protein might be the best option for one athlete, that doesn't mean it's the right choice for you. Remember that protein supplements can help athletic performance, but it is the hard work in the weight room and at practice that will ensure your development and allow you to reach that goal you have been training for. Read more about how how other supplements, like caffeine affect athletic ability.